Man! I love a European buffet breakfast. When Dave and I visited Reykjavik, Iceland last March (photos! ), our hotel served up an epic buffet every morning in the breakfast room. I loved it so much, I documented every detail in my journal. (The items that are underlined are the ones I ate. My travel journals are a treasure trove of my extreme nerdiness). It was my first time trying pickled herring, and it was weird but good. I didn’t expect it to be sweet, but once I got over the shock, I was all about it. The smoked salmon in Reykjavik is unlike any smoked salmon I’ve eaten before. It was beyond tender; silky is the adjective. Silky salmon! I should also mention that skyr, Icelandic yogurt, is one of the most delicious things I’ve ever eaten. It’s unimaginably thick, rich, and creamy with a very mild tang. It’s like a happy marriage of Greek yogurt and sour cream, and I wish I had some right now. One of the reasons I love breakfast buffets is because I can make the food however I want, and I love to put together tasty combos. 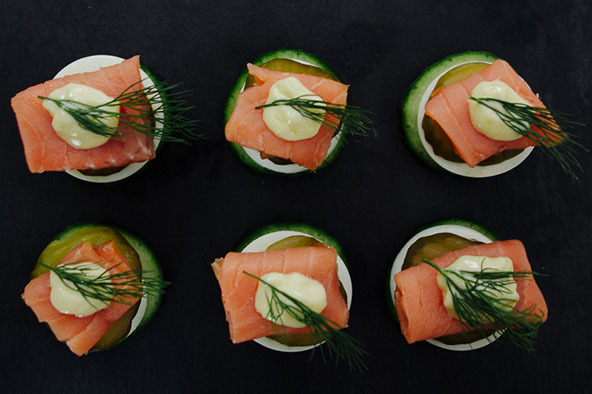 This recipe is the result of the stunningly fresh and flavorful Icelandic ingredients I piled on my plate each morning. It’s salty, crispy, creamy, cool—and whenever I eat it, it reminds me of our Icelandic adventures. I’ve give you two options because sometimes you want to fuss, and sometimes you just gotta eat. When I was on vacation, I had the time to be fancy, so I made myself breakfast hors d’oeuvres every morning. At home? Not so much. I just plop the ingredients in a bowl and pile it into my mouth. You do you. Decide if you’re going to be fancy or casual. 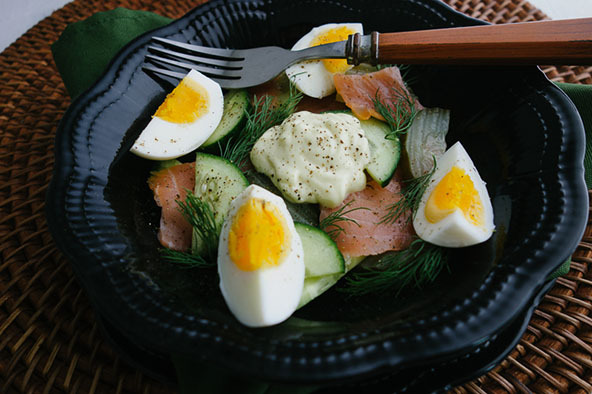 Cut the cucumber, pickle, and boiled eggs into even slices, then stack the ingredients: cucumber, egg, pickle, salmon, dollop of mayo, fresh dill, ground black pepper, fresh lemon juice. Cut the cucumber and pickles into thin half-moon. Slice the boiled eggs into quarters. 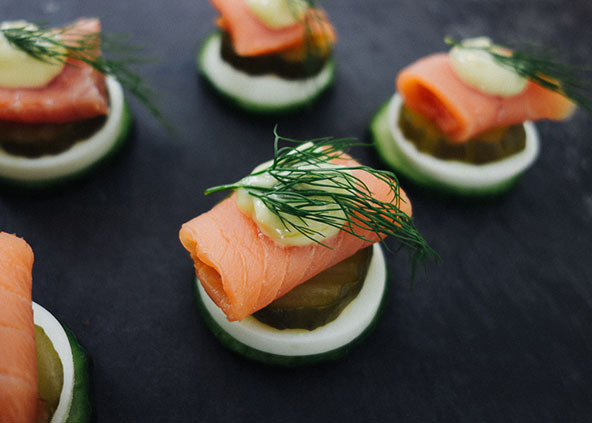 Place salmon, cucumber, and pickles in a bowl and arrange the eggs on top. Add a dollop of mayo, plenty of dill, and a sprinkling of ground black pepper, then squeeze a little fresh lemon juice over the whole shebang. When I cook my eggs for this salad, I use the technique from my post Perfectly Peelable Hard-Boiled Eggs, but simmer them for just 9 minutes. NINE MINUTES EXACTLY! This produces whites that are firm and yolks that are perfectly gelled. Nine minutes, friends; this is the magic number. Ahh…exactly what I was looking for. An easy, nutrient-dense idea for tonight’s dinner. 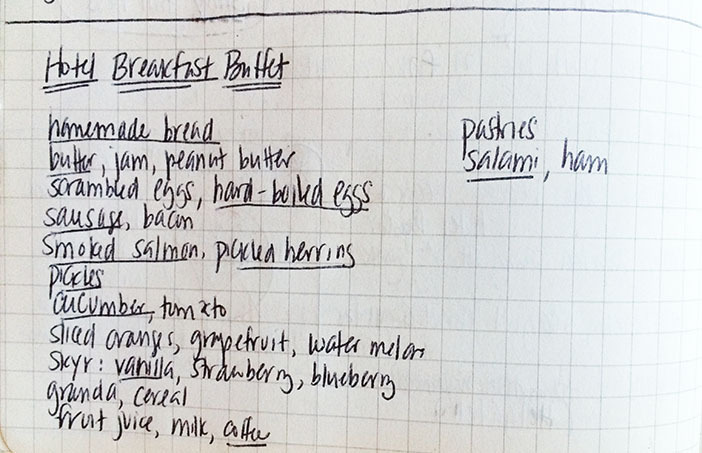 Love the backstory–now daydreaming of Iceland, travel journals and breakfast buffets featuring silky salmon. And love the fancy and casual option–I’ll be going casual. Thank you…and congrats on your beautiful new site! Lovely! I think I’ll try these soon. Love the gorgeous new website!! Thank you for the beautiful pictures of Iceland — truly stunning photography of a beautiful country. Very tasty! I made the casual version for lunch today. No pickles on hand, so used tomato slices instead. I’ve been enjoying your recipes and tips on how to put together meals. And I like your new site design. I’m glad you enjoyed it — thanks for your kind words! I was just looking at pix from our trip to Europe in March today and YES they do breakfast SO MUCH BETTER than we do! Love the post. Right?! 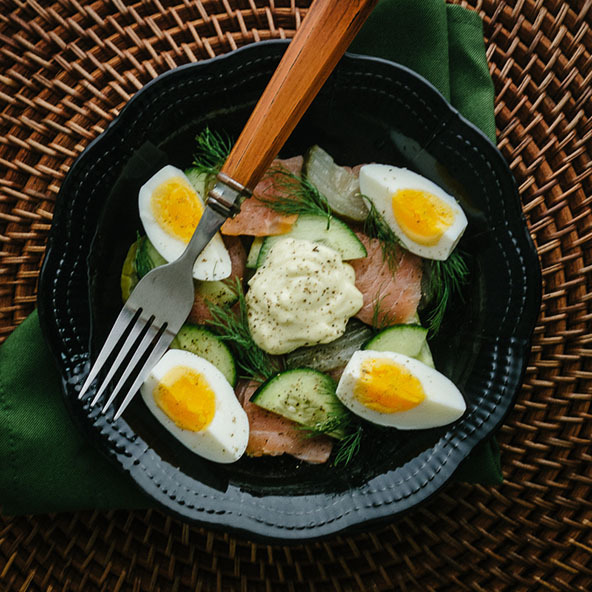 Cold cuts, sliced raw veggies, fruit, nuts, hard-boiled eggs… so much better than the typical American “Continental Breakfast” of muffins and cereal. Just now seeing this post. In 1972, I backpacked in Iceland for two months. Was lucky to experience a couple breakfast buffets. Differences and similarities: yes, pickled herring! A food my family ate during the holidays, so the familiarity was a comfort. No, to smoked salmon. Instead: dried fish fillets slathered in butter. All skyr was plain – and served with corn flakes.